Wow! You won’t find a more elegant, turn-key home at the lake at such a fantastic price. Super clean & wonderfully cared for inside &out. This 3/2 mfg. home shows like a model. Ideal for full-time living or weekend get-away. Nicely decorated & spacious with awesome elevated views of the adjacent greenbelt & surrounding oak-filled hills. It has been completely remodeled & has a well-designed floor plan with vaulted ceilings, dual-pane windows, ceiling fans, paneled doors, and indoor laundry rm. The kitchen features Corian countertops with tile backsplash, breakfast bar, oak cabinets, matching appliances, can lights, under-counter lights, and lots of cupboards incl a counter that wraps around to the dining rm. The 3rd bdrm or bonus rm has double panel doors and is separated from the other two bedrooms; perfect for guests! 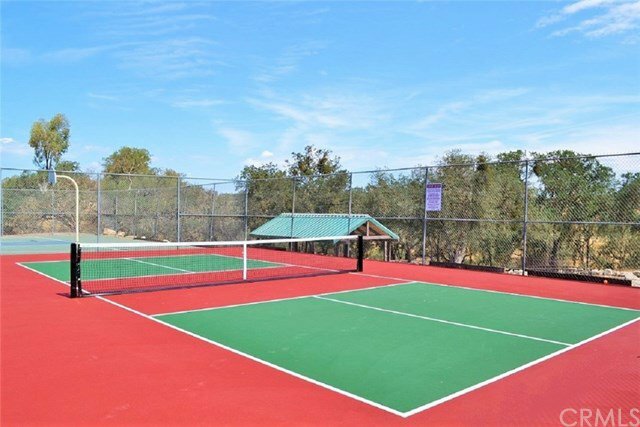 Step onto the huge vinyl deck from the kitchen or living rm to the large easy maintenance back yard with artificial turf, step-stone walkways, horseshoe pits, table grape vines, storage shed, and dog run. The yard opens to the greenbelt with seasonal creek & walking paths. Addtl features incl newer steel roof & siding, workshop area under the carport with locking cabinets, & security system with cameras & motion lights plus a 2nd driveway for extra parking. This home is located just a short stroll to many amenities incl the equestrian center, parks, pools, driving range, & more. On a permanent foundation & qualifies for FHA, VA, or conventional financing. Selling Office: Country Real Estate, Inc..